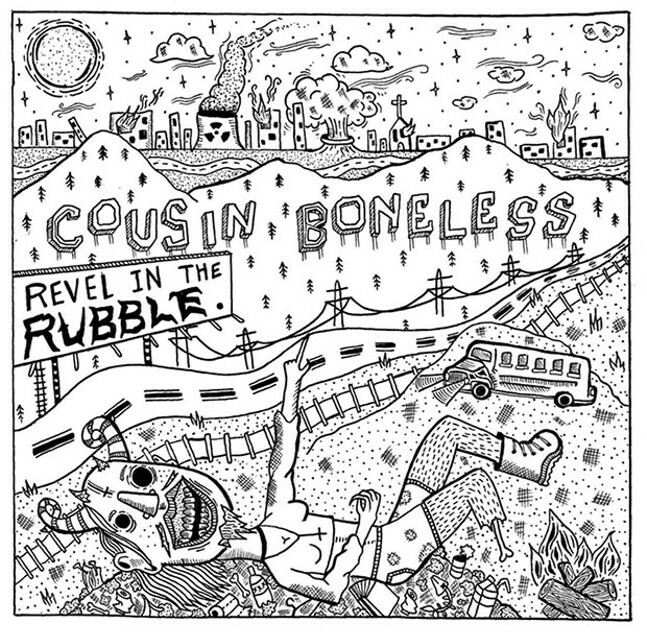 Cousin Boneless is an eight-piece street-folk band with a dark underbelly that thrives on busking on street corners and taking its music out as a mobile freak show — a roaming celebration of the absurd and otherworldly. Its latest release, Revel in the Rubble, is the third and final piece of the ensemble’s Garbage Party trilogy. The vocals range from gritty and sinister growls to soulful belting, sometimes all together in a pile of group vocals that makes eight musicians sound like 20. It’s the soundtrack to a raucous party in the dive bars of hell, a liquor-soaked celebration after a lifetime of discontent and torture mingled with bliss and joy. Revel showcases soundbites from pop culture to accent topics woven subtly throughout the lyrics: subjects like anarchy, before “Grow” (Talladega Nights: The Ballad of Ricky Bobby); worker’s rights, before “Pickin’ and Sinnin’” (Monty Python); and the false promise of free will, before “Emojis From the Underground” (True Detective). The album is a social critique, as well as a critique of the self. Cousin Boneless has a spooky sheen to everything it does. The lonesome warble of a singing saw in each composition certainly helps give off a ghostly choir effect. But the darkness is offset by a manic celebration of doing your best in spite of the dismal conditions around you, a celebration that reminds you to laugh and be goofy and carefree in spite of the suffering in our world. Who says burning in hell can’t be a little bit fun too?